Q&A: When was the first porcelain made? When was the first porcelain made? As early as the Shang dynasty (16th - 11th century B.C.) a white stoneware was made in China for the first time. Glazed "porcelain" is also found for the first time during this period. The making of blue-and-white Chinese Porcelain started in China by the time of the Mongolian invasion, in the mid-thirteenth century. By the time of the Roman Empire Chinese "green wares" from the south of China was exported to neighboring countries. About 1000 years ago the Chinese had become one of the greatest naval powers of the world and engaged heavily in the export of early white porcelain still to be found all over South East Asia, having adjusted their distaste for trade accordingly to fit their need for money to fight the invading barbarians. With the Portuguese discovery of a sea route to China in the 16th century, the Europeans soon became their most demanding customers. The repertoires of Chinese porcelain manufacturers were completely transformed to suit the complex social habits of Europeans. Often, orders from Europe were accompanied by drawings or models to show precisely what was desired. 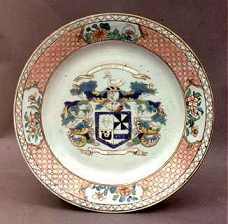 (This plate is one of Colin Campbels' dinner plates made in China in about 1730.) Chinese Porcelain was bright and shiny, it rang when struck, it was harder than steel yet brittle. It was heat-resistant, easy to clean, impervious to liquids and to the 17th century Europeans - used to earthenware and wooden plates - both a miracle and a mystery. Until the late 17th century the secret of porcelain manufacture was unknown outside of China. Until the secret of porcelain making was discovered in 1708 by the German alchemist Johann Friedrich Böttger, everybody had to import their porcelain from China. During the 18th century ceramics manufacturing developed from a craft into an important industry in Europe. Although the Chinese attempted to compete with the English products by imitating them, by the early 19th century English "china" had largely replaced Chinese Export Porcelain in western homes. However, Chinese Export Porcelain never completely disappeared from western markets. Today, we can still find Chinese Export Porcelain in our stores. Made with many of the original designs and colors, it still has the same qualities that made it famous.